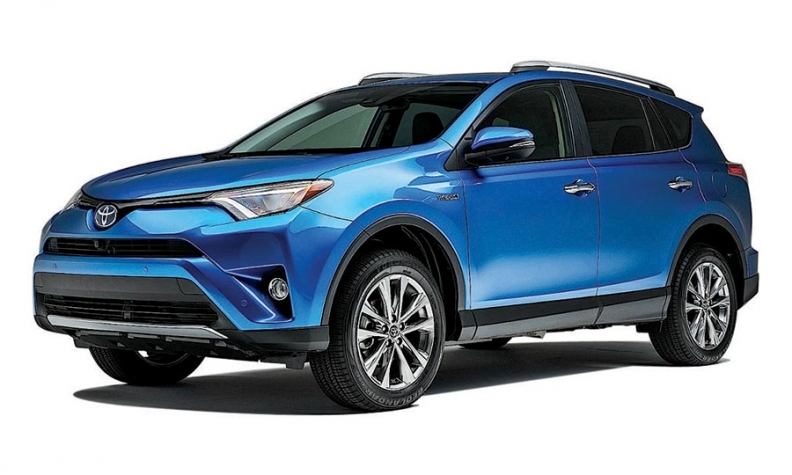 Toyota expects the 2016 RAV4 Hybrid variant to help lift the nameplate's sales. LOS ANGELES -- How good does Toyota feel about its freshened RAV4? The number 400,000 provides a clue. That's the annual U.S. sales target Toyota has set for its compact crossover within three years, more than triple the number of RAV4s sold in 2011 and a healthy jump from the 300,000 sales expected in 2015, itself a record for the nameplate. To hit 400,000, according to Bill Fay, Toyota Division general manager, three things need to grow: the overall new-vehicle market, cross-overs' slice of that expanding pie and the RAV4's share of that slice. "With everything we're seeing, all three of those are very possible," Fay told Automotive News last month at the Los Angeles Auto Show. "By adding an SE and a hybrid, I think all that could fall into place and clearly push us in that direction." The sport-tuned SE and the fuel-sipping hybrid variants are new for the 2016 model year. Other improvements to the RAV4 lineup -- on sale now -- include a sleeker exterior, a retuned suspension and a quieter, more refined interior. The updates aim at staying competitive in a segment that has grown 17 percent this year through November. Toyota's RAV4 is second among compact crossovers with 283,546 sales, behind the Honda CR-V's 314,462, and just ahead of the Ford Escape's 278,538. Toyota may be bullish on the prospects of its updated RAV4, but the automaker faces some stiff headwinds in the coming years. While the industry looks to continue its breakneck sales growth through 2016, volume is expected to at least level off -- if not decline slightly -- in 2017, threatening one of the three pillars of Fay's forecast. This stagnation will last through the decade, according to Eric Lyman, vice president of industry insights at TrueCar. "Trying to grow 30 percent volume in a market when overall sales volumes are flat or declining is a significant challenge," Lyman told Automotive News. What's more, the compact crossover segment is quickly eclipsing midsize sedans as the fiercest battleground for sales volume across the industry. So, gaining market share for anyone will be a chore. Indeed, the top three sellers in the segment (CR-V, RAV4 and Escape) lost market share in the first 11 months of 2015. Such intense competition typically ushers in incentive wars and lower transaction prices. "The real question will be whether Toyota can do it in a healthy way and whether there's a natural demand in the marketplace that would support 400,000 units," Lyman said. But the RAV4 has plenty going for it. Since Toyota helped create the compact crossover segment by introducing the original RAV4 in the mid-1990s, the company has sold 2.5 million of them in the U.S. Pair that awareness with the meaningful improvements Toyota made to the RAV4 for 2016, and that 400,000 goal appears more realistic. "If they're picking any vehicle to grow with that amount of volume," said Lyman, "the RAV4 is it."